The Hungarian state, which is situated in the Carpathian Basin, has a history of more than 1000 years. The western part of its territory was part of the Roman Empire until the end of the 4th century. The Romans called this part Pannonia and they founded here many cities and fortresses. At the beginning of their history, the Hungarians were nomadic people. Under the leadership of Árpád in 896 seven Hungarian tribes conquered the Carpathian Basin. In the 10th century the Magyars invaded Western Europe. However they gradually settled down. In 1000 Prince Stephen, one of the descendants of Árpád, was crowned king of the Hungarians. He is the founder of the Hungarian Kingdom and the Catholic Church in Hungary. Later he was canonized and became the most popular saint in Hungary. His feast day (celebrated on 20th August) is the most important national holiday in Hungary. The so called "Saint Stephen-Crown" is the main symbol of the Hungarian State. During the middle Ages the Hungarian Kingdom flourished and was entirely integrated into the western European civilisation. The Kingdom was inhabited mostly by Hungarians, but there were also other nationalities here: Germans in the cities, Romanians and Slavic peoples. From the beginning of the 14th century Hungary was a powerful kingdom of Central Europe and resisted successfully the Turkish invaders. The most famous king of this era was the renaissance king Matthias Corvinus in the second half of the 15th century. He was a strong-handed king, his library, the Bibliotheca Corviniana, was Europe's greatest collection of historical chronicles, philosophic and scientific works in the 15th century. After King Matthias the country's defences declined. In 1526 the Turkish army defeated the royal army at Mohács, and the king died in this battle. In the hope of effective support against the Turks the Hungarian nobles elected a new king from the House of Habsburg, who was the Emperors of the Holy Roman Empire. From this time on the Habsburg rulers were Hungarian Kings as well, until 1918. However they could only control the western and northern parts of the Hungarian Kingdom. The Turks occupied the central parts of the Hungarian Kingdom. In the eastern parts of the Kingdom the half-independent Principality of Transylvania established. The Princes of Hungary attempted to unify the former Kingdom of Hungary several times. 150 years passed before the entire Kingdom of Hungary was removed from the Turkish rule. As a consequence of the constant warfare the number of the Hungarian inhabitants was diminished, while the number of German, Romanian, Slovakian and Serbian inhabitants of the Kingdom increased. In the 18th century Hungary was part of the Habsburg Empire. The Habsburg rulers wanted to unify their empire, and made efforts to rebuild and modernise the politic and social life of the Hungarian Kingdom. However, the Hungarian nobles opposed to these efforts and insisted on their own laws. In the Revolution of 1848 the Hungarians achieved independent status within the Habsburg Empire, and Hungary was to be a constitutional monarchy sharing a king with Austria. But the Habsburgs ma naged to mobilise the Rumanian, Serb and Slovakian minorities against the Hungarians and finally they suppressed the Hungarian movement in 1849. In 1867 the Hungarians came to an agreement with the Habsburgs and so the dualistic system of the Austrian-Hungarian Monarchy was born. In this era the Hungarian economy improved significantly. Budapest became one of the most beautiful cities in the world. The symbolic figure of these years was Elisabeth/Sissy, the wife of the emperor and Hungarian King Franz Joseph I. After losing World War I, on 4 June 1920, the Trianon Peace Treaty was signed. It split up the country. Hungary lost 71% of its territory and 66% of its population. 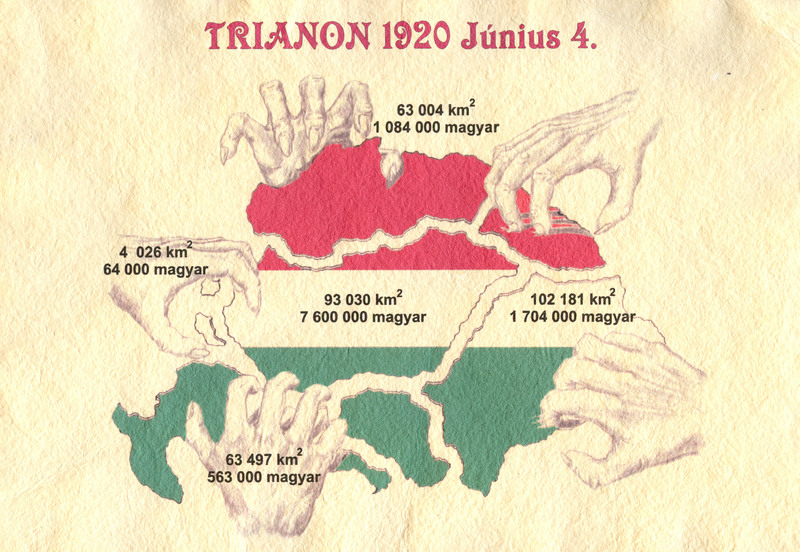 About one-third of the Hungarian population (3.4 of 10 million Hungarians) became minorities in neighboring countries. Down to the present day many Hungarians are living in the neighbouring countries like Romania, Serbia or Slovakia. During World War II Hungary was fighting with the Germans against the Soviets. As the government tried to change sides to the allied Atlantic countries, Germans overran the country and deposed the government. Hundreds of thousands died during the wars or were deported to German concentration camps. Following the fall of Nazi Germany, Soviet troops occupied the country, and Hungary gradually became a communist satellite state of the Soviet Union. Many democrats were secretly arrested and taken to inland or foreign concentration camps. This situation led to the Hungarian Revolution of 1956 against the communist dictatorship (23rd October, 1956). The Hungarian people fought heroically but the Russians were much stronger and after a few days they crushed the uprising. The communist system was consolidated. However in the 1980s, Hungary began to suffer from inflation, Hungary ran up a huge foreign debt. In the late 1980s a wave of discontent and demands for reform grew in Hungary. In July 1989 Hungary dismantled its border with Austria, and the Iron Curtain fell. The first free parliamentary election was held in May 1990. There was a peaceful transition to democracy. Inevitably there was an economic crisis in the 1990s and the transition to capitalism was painful. However, Hungary is now a prosperous and free country. In 1999 Hungary joined the NATO and in 2004 Hungary joined the EU.